Well, this is going to be a fairly short entry today. We rounded the corner toward home, but still saw some pretty cool stuff. 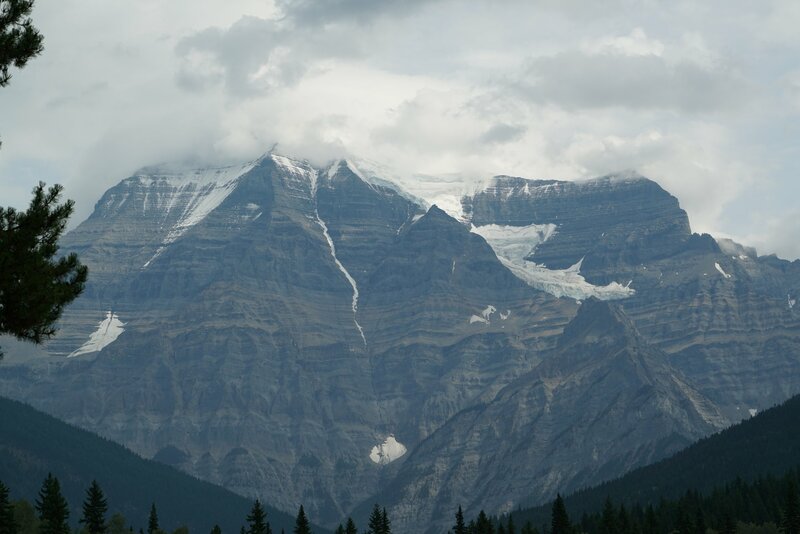 We almost rode past the Mount Robson visitor center, but the timing worked out with our normal rest break interval, and I also happened to peek over my shoulder as we approached (and saw the mountain, which was pretty cool). 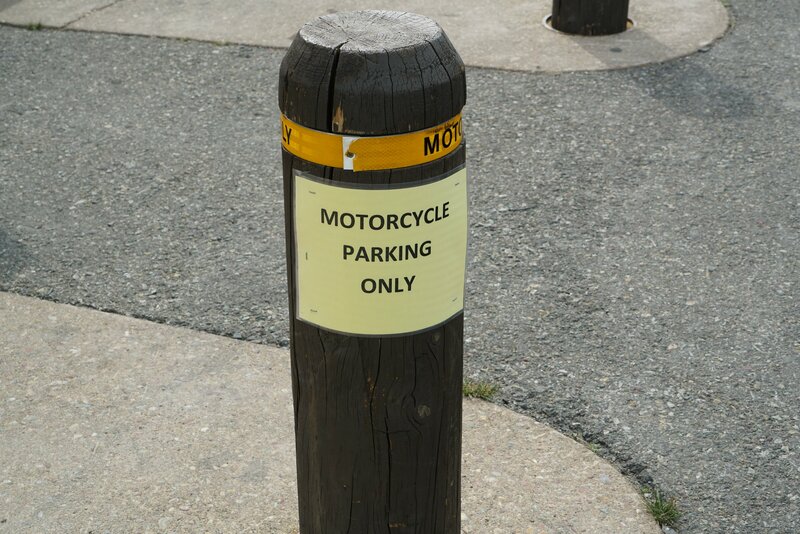 I didn’t know anything about this place until we rode through. 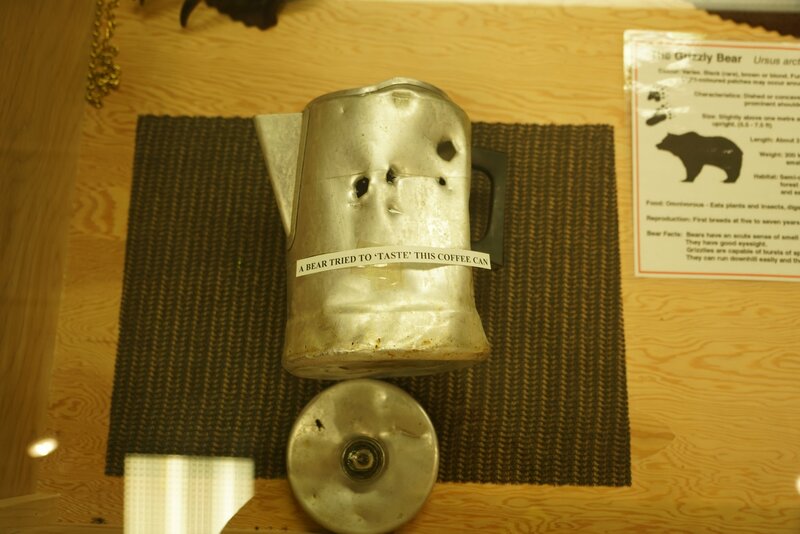 The visitor center has some nice exhibits, you need to go downstairs to see them (I didn’t think it was marked very well). 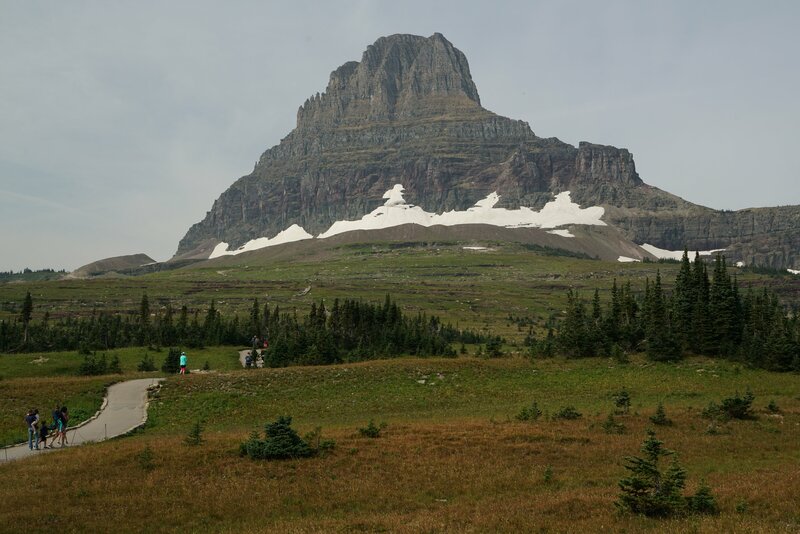 A picture of the old man from the visitor center parking lot. 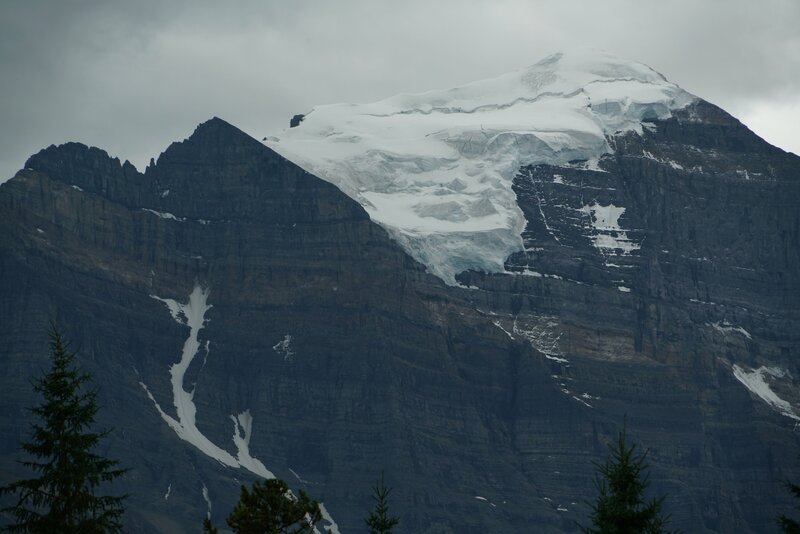 Mount Robson with the peak obscured by clouds. Need to color correct these next two when I get home. 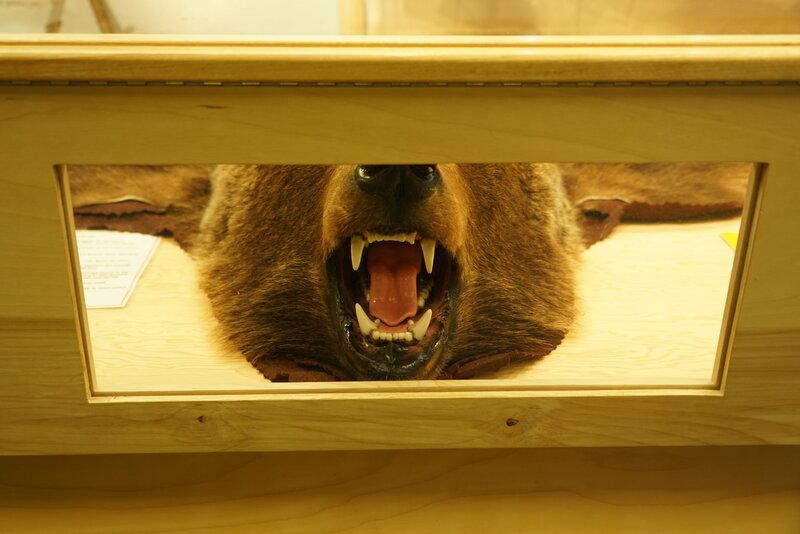 The grizzly bear exhibit was set up so you could look down it’s throat. Apparently grizzly bears like coffee. I don’t think my aluminum panniers would have a chance. I didn’t get any pictures, but they had a bunch of the local gamefish mounted as well. Another exhibit explained how the Rocky Mountains were formed. As we headed further south, we started to get in the smoke again. Just enough to obscure the views. We stopped for lunch in Blue River at the helicopter lodge. At this point we decided we were making good time and booked a hotel room in Merritt, which is about 45 miles south of Kamloops. The hotel we picked is brand new… So new that the room still smells like fresh paint. Tomorrow, we’ll eat or complementary breakfast before blasting home. We are close enough that we should be home by lunch and miss the afternoon traffic. Man was our room hot last night! It got to the point that my dad had to go find the ice machine to keep his medicine cool. Didn’t have too much trouble sleeping though. We got a bit of a late start today. We slept in late and had a sit down breakfast at the hotel restaurant. By the time we got our bikes loaded and were on our way, it was 11a. 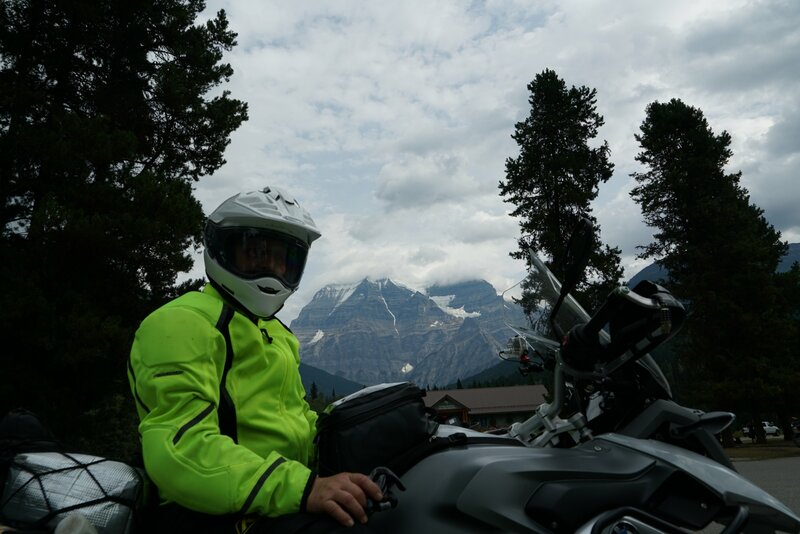 The plan for today was to ride the Icefields Parkway, which isn’t terribly long, and we had camping reservations near Jasper, so leaving late was not a big deal. Most of the water up there is a cool blue color. 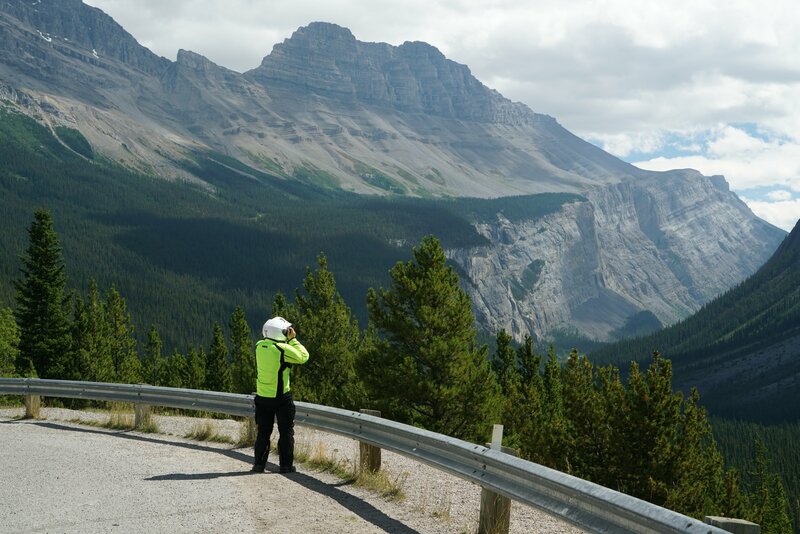 After that, it was time to hit the Icefields Parkway. 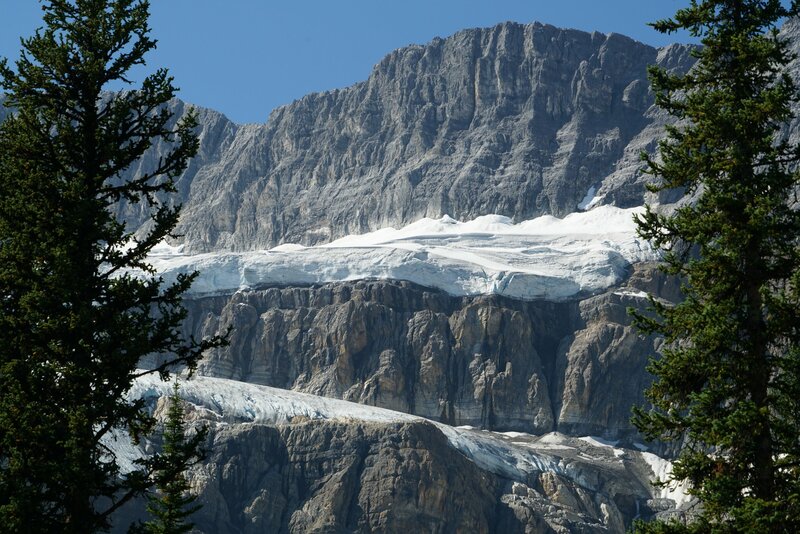 Banff had most of the mountains and ice. 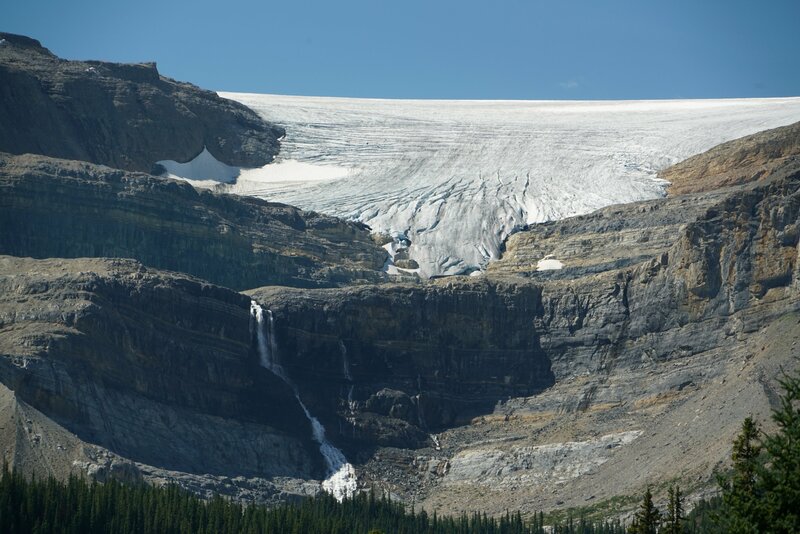 This is Bow Glacier and Bow Glacier falls. The old man taking some scenery pictures. 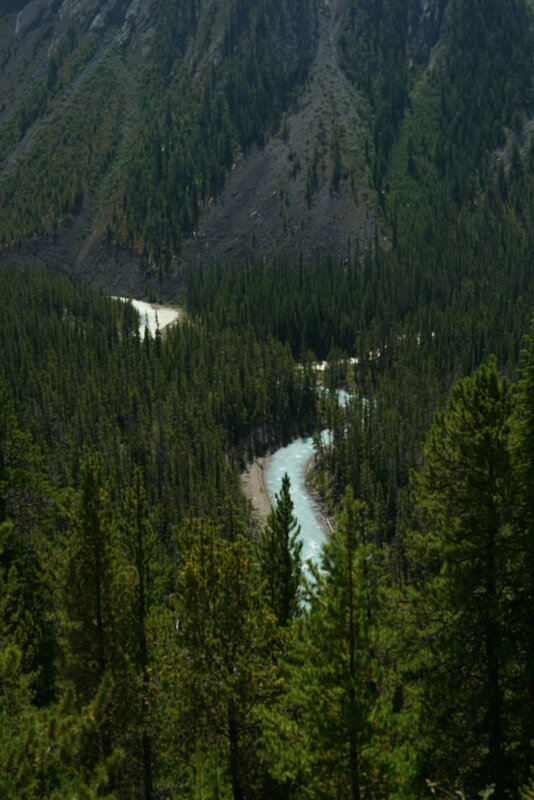 Even the rivers were blue. Cool mountain… Didn’t even get off the bike to take this one. 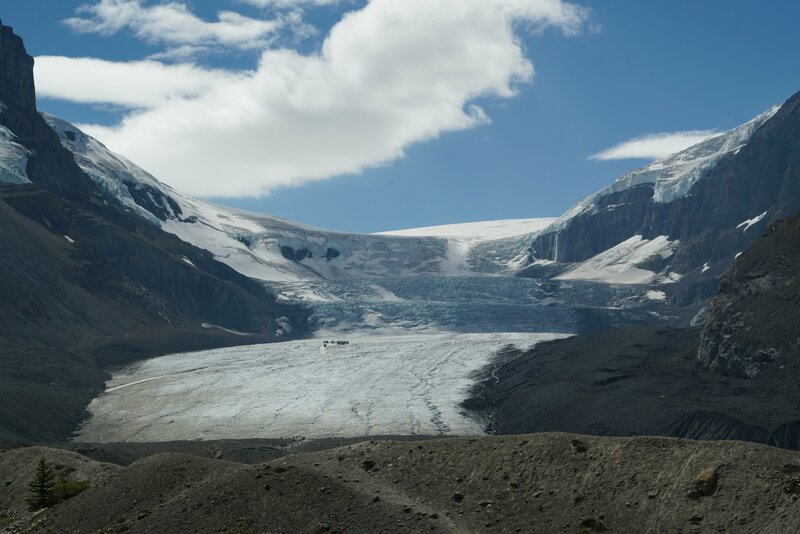 Once you cross into Jasper National Park, you come to Columbia Icefield. 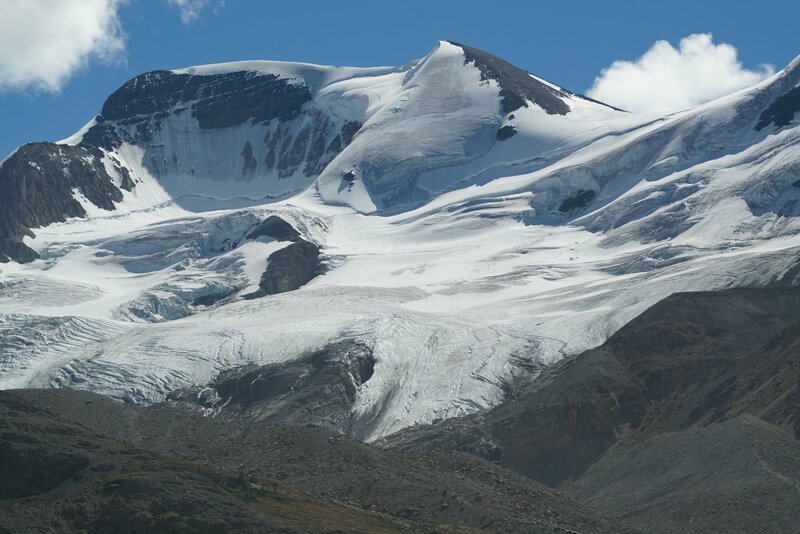 To give a sense of scale, those dots on the left side of the glacier are big tour buses. And that was just about it for glacier. 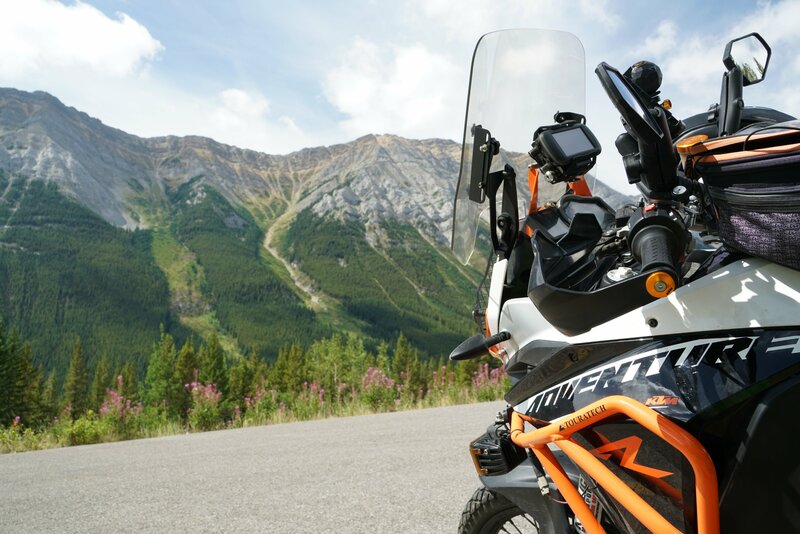 The rest of the ride north was through forested land with rigged mountains on either side, although it was not as impressive as the ride through Banff National Park. 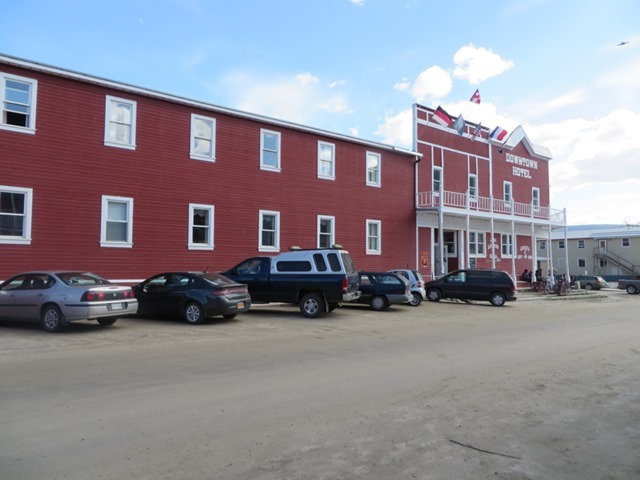 We stopped at Sunwapta Falls Lodge for a late lunch… So late, that we should dinner. We pulled into our campsite around 5p. 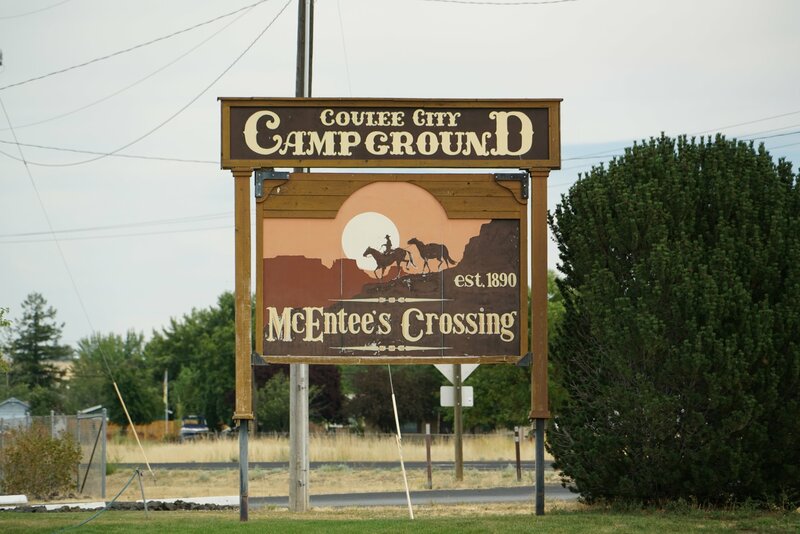 The campground is huge, and the sites don’t have a lot of privacy. It does have nice bathrooms with running water. Tomorrow we head toward home! Our goal is to get to Kamloops tomorrow and stay in a hotel so we can get an early start Thursday and beat the afternoon traffic. We did not get eaten by bears last night, but it was pretty close. 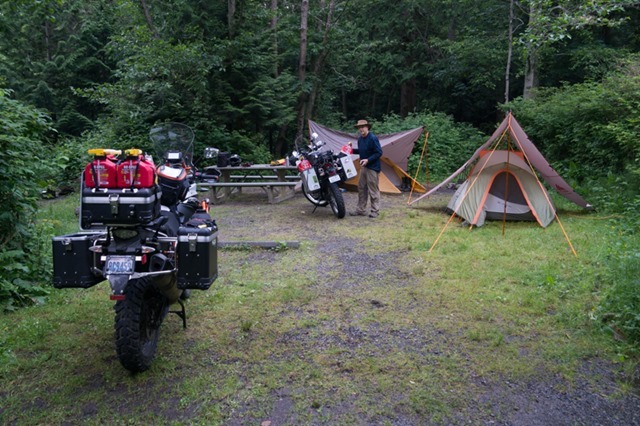 As we were packing the bikes this morning, a couple of park rangers came out of the bushes near or campsite. They thought we were just arriving, and wanted to make sure that we knew there were a couple of bears in the area feeding on berries. I guess we didn’t look berry-like last night. Our start time seems to be 9a every day, because that’s when we hit the road again. It was a bit cooler out this morning, so I wore my down jacket underneath my motorcycle gear and opted for my heavier gloves. 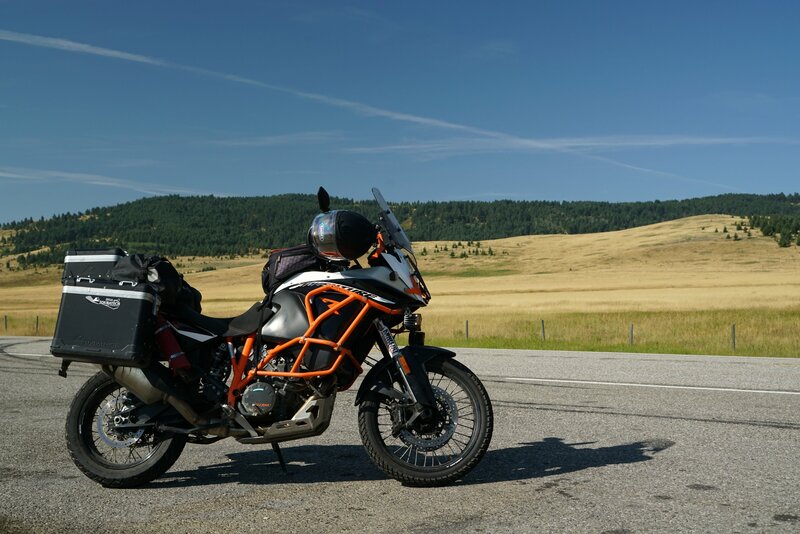 The first half of our ride today was heading north through Alberta to Longview. This area is where the plains meet the Ricky mountains. Much of the ride looked like this picture. Today was also eclipse day, and I brought a couple of pairs of eclipse glasses. We pulled over on the side of the highway and stared at the soon like a couple of dorks for about half an hour. At the peak, the sun was about 80% eclipsed. It never got very dark, the light just turned a bit orange. After Longview, we cut over to highway 40 and into the mountains again. This was a very cool road to ride, with big, jagged mountains on both sides. Panorama at one of our rest stops. 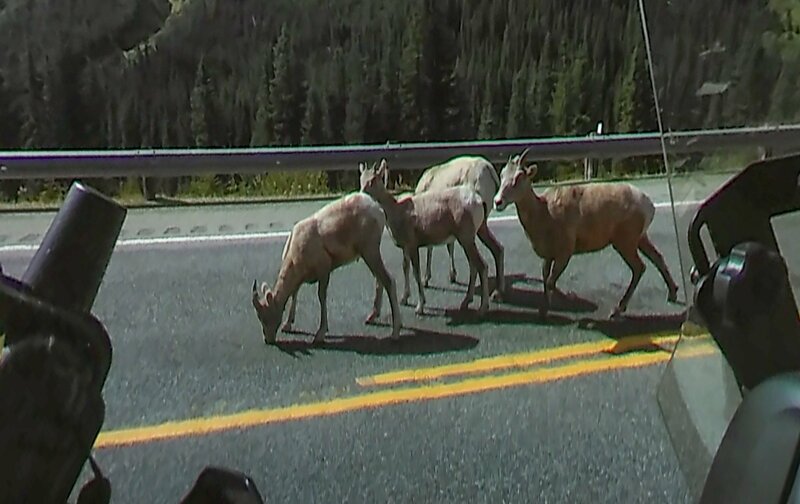 We also passed several small herds of Rocky Mountain Sheep. The largest group was blocking the road. I did a screen grab from my 360 fly from the drive by. After highway 40, we started heading west on Highway 1 toward Banff and Lake Louise. This was a four lane road that didn’t seem quite as scenic as highway 40, but it was still pretty cool. We pulled into the hotel at Lake Louise, and this is the view from the parking lot. First hotel of the trip! Which means I got my first shower since leaving, and boy did it feel good. We hooked up with some friends from back home for beer and dinner. Kinda cool that our schedules randomly had us here at the same time. 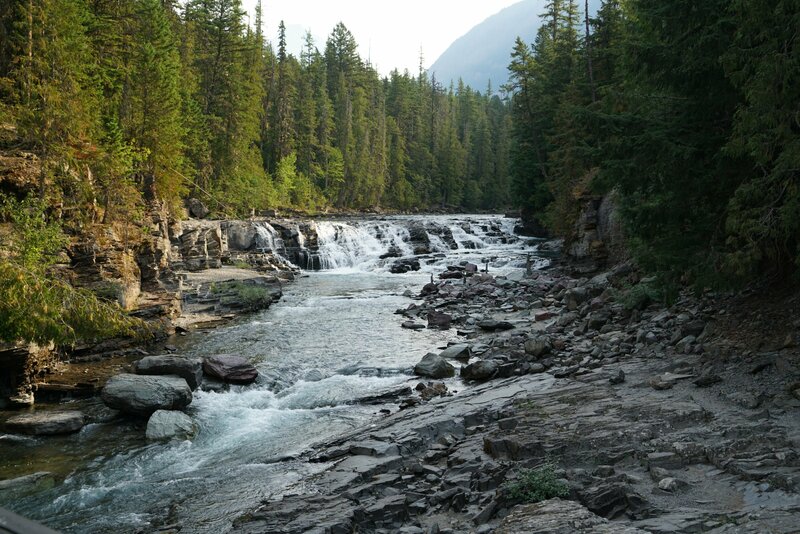 Tomorrow we’ll be heading up to Jasper, hopefully will get some more good pics. Well, we wanted to get an early start today, so of course we didn’t get out until 9a again. I figure this is like starting an hour earlier than yesterday because we are one timezone earlier. We were camped very near the park entrance, so it didn’t take us very long to get into the park. 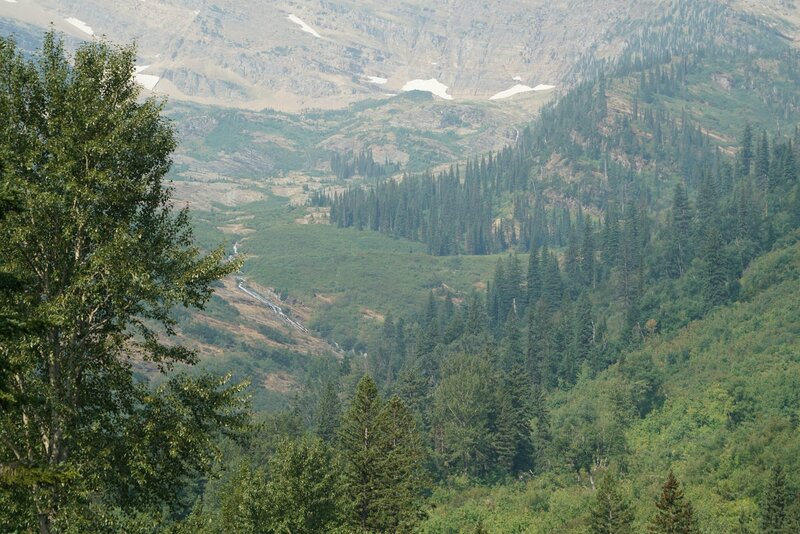 Our first stop was an overlook at Avalanche Creek. A little further on, there was a roadside exhibit about avalanche chutes. The hillside the exhibit referenced was kinda meh, but across the way there was a cool little waterfall. After that point, we did not stop for pictures until we got to the top of Logan Pass – there was just enough smoke in the air too ruin them. Even so, there were a ton of people on the road. When we got to the parking area for the visitor center, it was full, with lots of people looping around. We were saved by this sign! 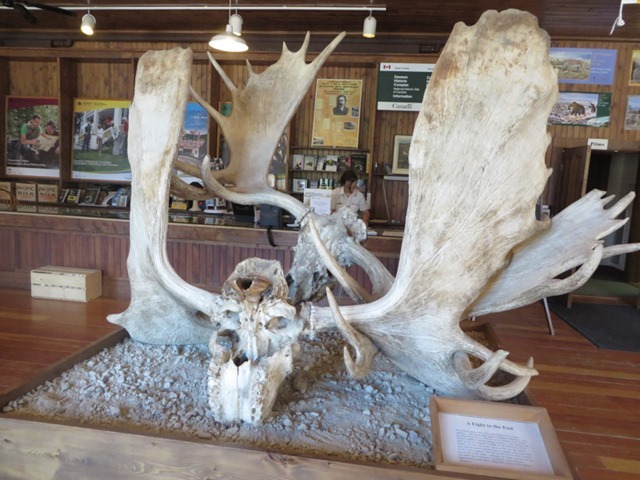 We walked through the visitor center. There really wasn’t much more than a gift shop on the inside. We went outside and looked around for a bit. 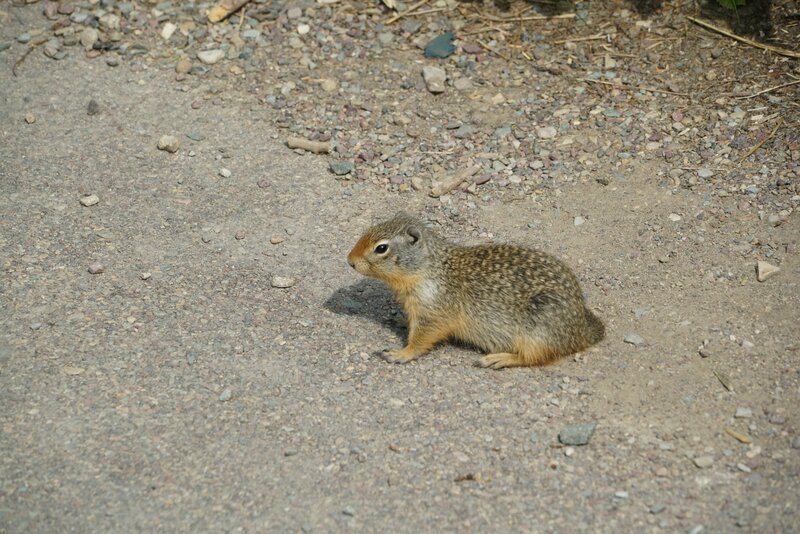 There were tons of these little guys everywhere. 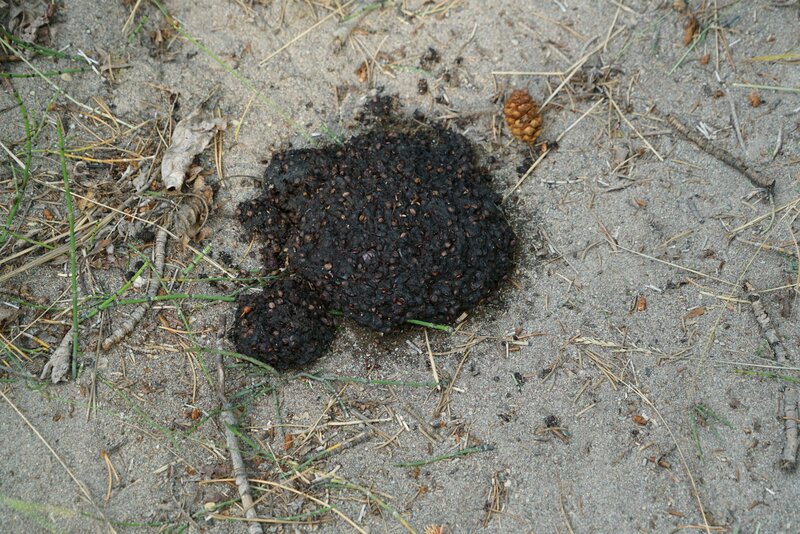 We didn’t want to go for a longer walk, but I took a picture of the trail. I underexposed the picture a bit – seemed to help get rid of the smoke. 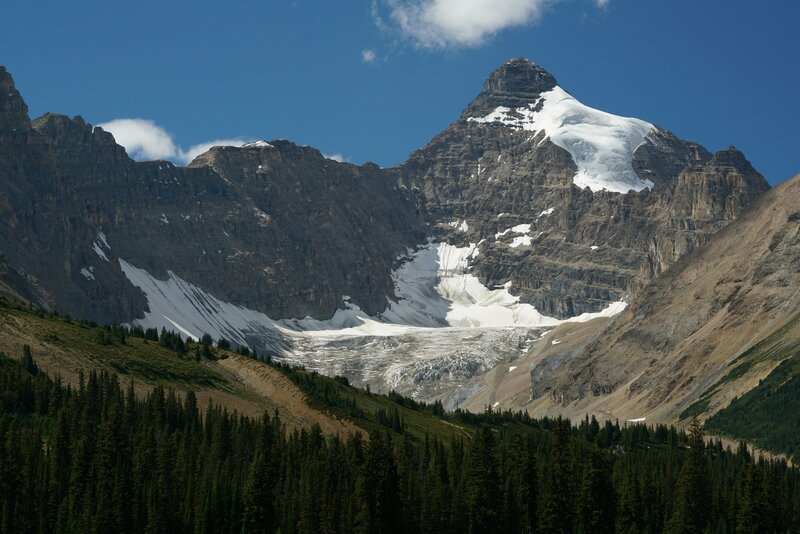 From Logan Pass, we descended into St Mary. The smoke was way worse in this direction. We stopped at the St Mary Lodge for some lunch, and the hostess said that there was a new fire nearby. 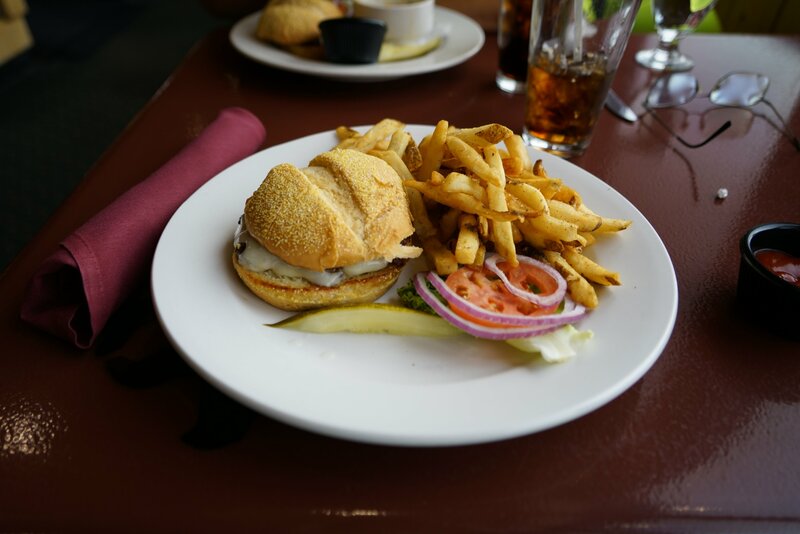 For lunch, we both had bison cheeseburgers. From the border we crossed into Waterton National Park. 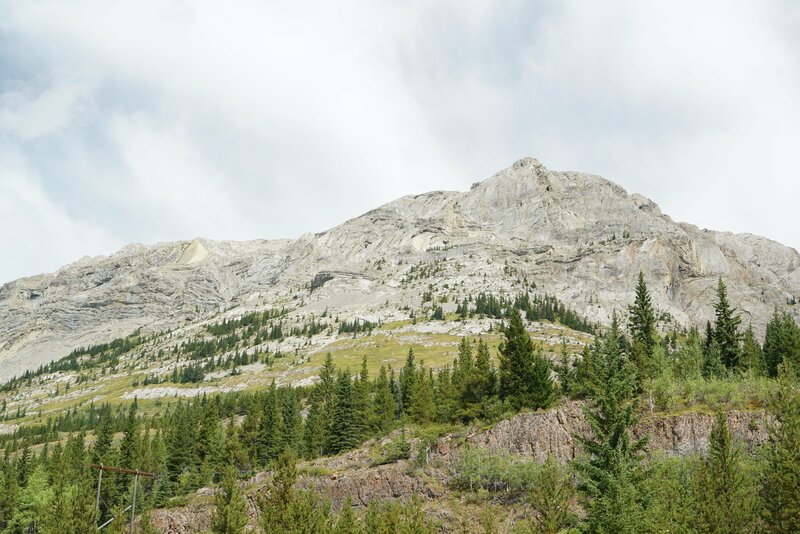 It was pretty interesting – you start in a high plains area, and then, all of the sudden, there are mountains. 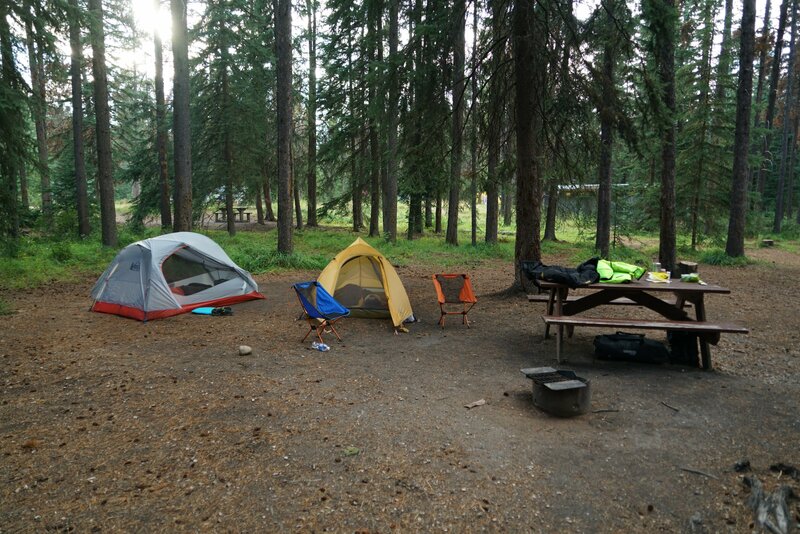 We decided to head straight to Crandell campground to nail down a site. The smoke isn’t too bad up here, it kind of comes and goes. 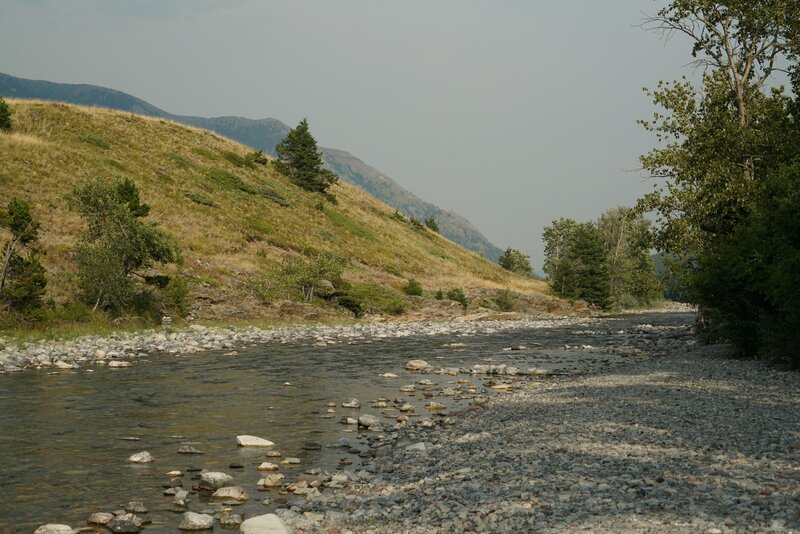 The campground is located along a river at the bottom of a valley. 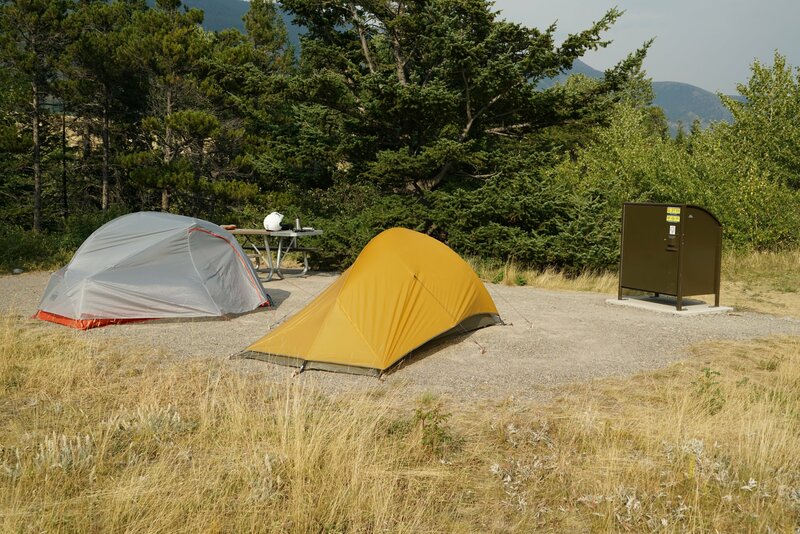 There are over 100 sites here, but they do a good job of keeping them fairly private (except for the one they have us… We can see the back of a camper). 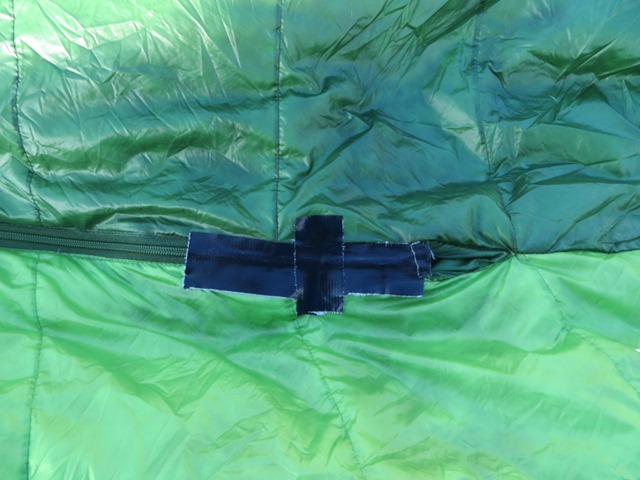 It’s been fairly windy, making it a little tough to get the tents set up… All of the guylines are deployed. We had a deer walk through our campsite right after we arrived! My camera was still in my tank bag and she walked between me and the bike. Our site is also near the river. There drinking water tasted like it was coming out of a hose, so we walked down to get river water (which we purified ourselves). 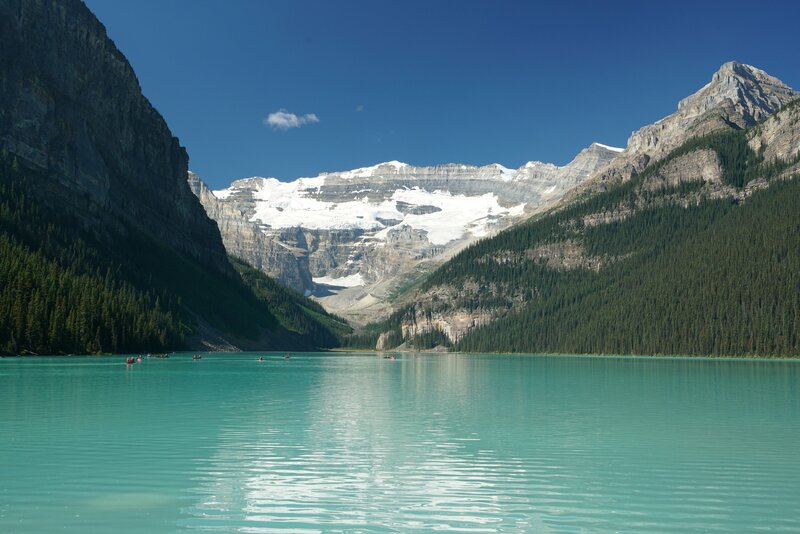 Tomorrow we head north to Banff, and our hotel at Lake Louise. We are going through the park South of Banff, so I figure it’ll be about a 6 hour ride. I think we will probably pull off the road during the eclipse… Don’t want to worry about distracted drivers. If we find a good spot, we may even pull out our eclipse glasses and watch. Started our trip today! 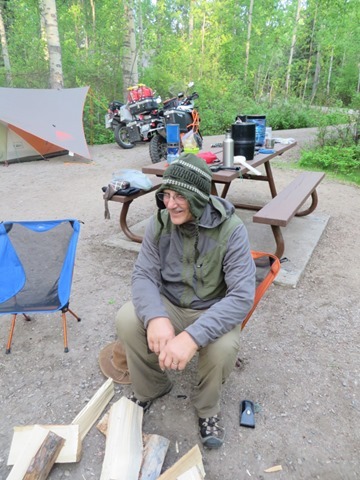 While I was waiting for my dad to arrive this morning, I did a Facebook live walk-around of my bike – I’d post a link, but I’m composing this offline since we don’t have internet access at our campsite. So, I’ll just post a picture of my bike in the driveway. The first part of the ride took us over Stevens Pass – a trip I’ve done a million times. As we were descending the pass into Leavenworth, we saw a deer crossing the Wenatchee river. Unfortunately there was not a good place to pull over and take a picture. 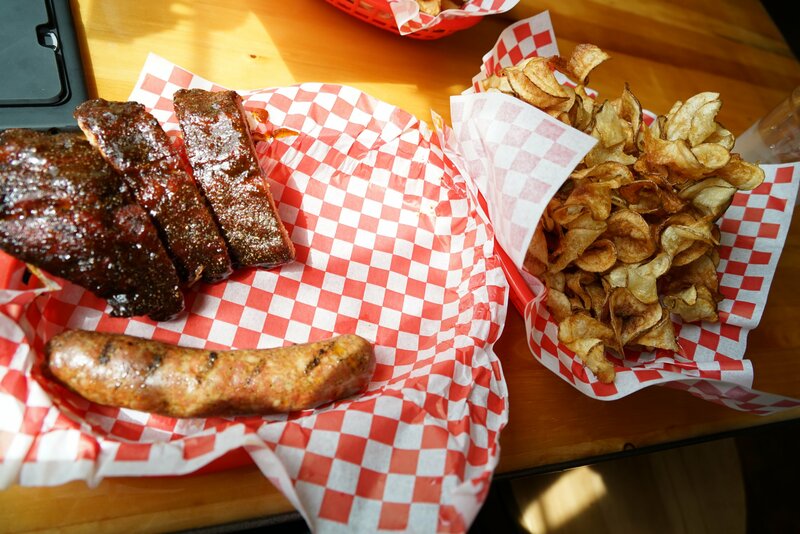 For lunch, we stopped at our favorite BBQ stop in Cashmere. After lunch, we topped off out fuel and continued on Highway 2 across the Columbia River. 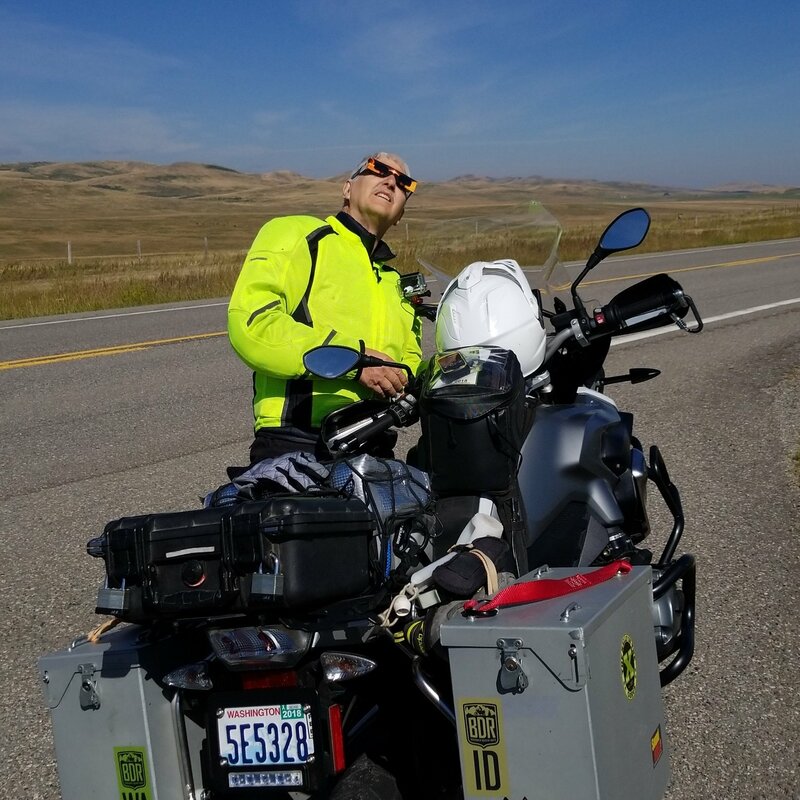 Once we climbed away from the river, we were hit with some pretty good cross winds until about Coulee City. 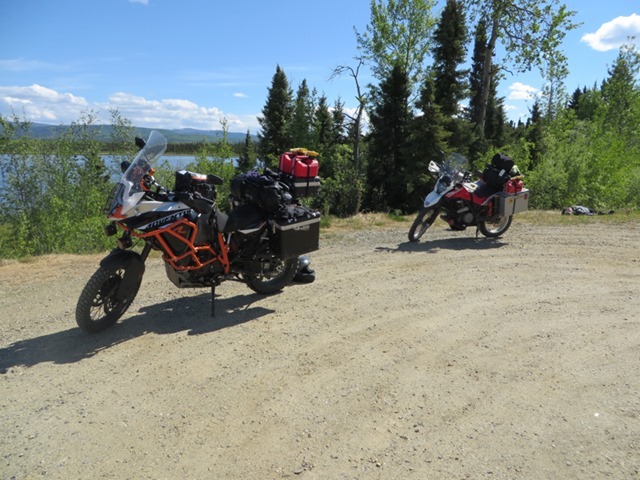 We stopped for a quick break at the boat launch/campground at the South end of Banks Lake. 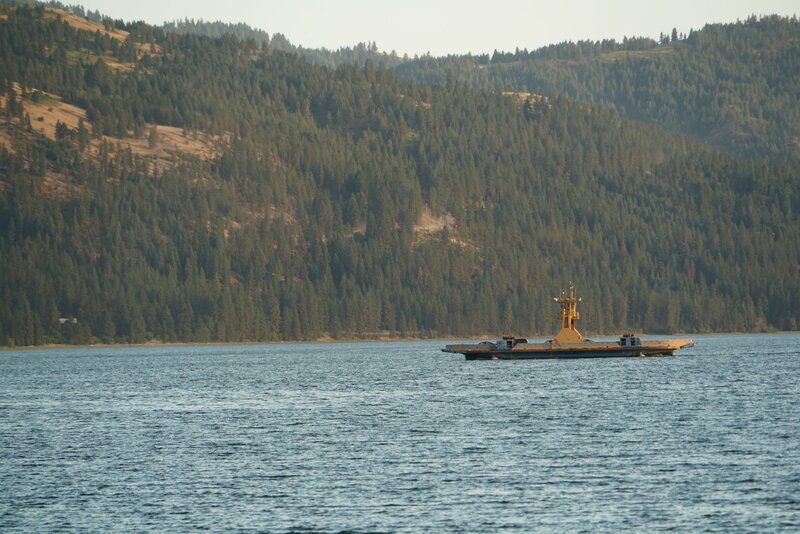 After the rest break, we continued on to Wilbur before turning North to take the Keller Ferry across Lake Roosevelt. 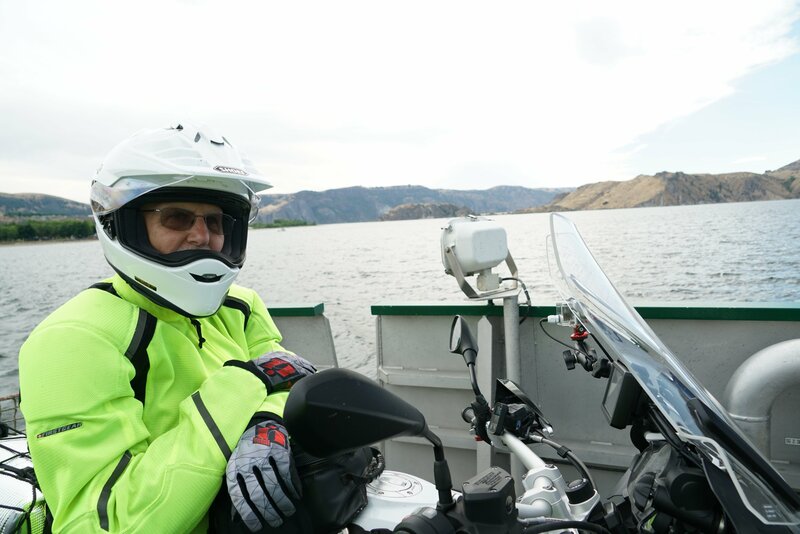 I have to say the descent to the ferry landing was a very cool and twisty road – almost too twisty – there are several hairpin turns requiring you to slow way down, it was kind of hard for me to get in a groove. As we approached the landing, they held the boat for us so we didn’t have to wait for a round trip. I tried to take some photos while sitting in my bike with my helmet on… This one came out the best. After the Keller Ferry, we headed toward the Gifford-Inchelium ferry. To get there we took Bridge Creek Road, which wear another awesome windy road. The problem – they was an active fire nearby and they were using this road to stage all of the equipment and firefighters. Ok, it wasn’t really a problem, there were just a couple of areas where we needed to slow down. There was also some smoke in places, but not too bad. We weren’t (and still aren’t) sure how far until our next fuel, so we stopped in Inchelium for fuel. They only had 87 octane, I supposed one tank of regular unleaded won’t kill me. However, this is where the first bike issue came up… The fuel is not coming out of my camel tank. I just had the bike in for service yesterday and they must not have hooked it back up correctly. It is not the end of the world, my range will be limited to about 240 miles. After the gas stop, we hoped on the next ferry, which landed just down the road from our campsite…. 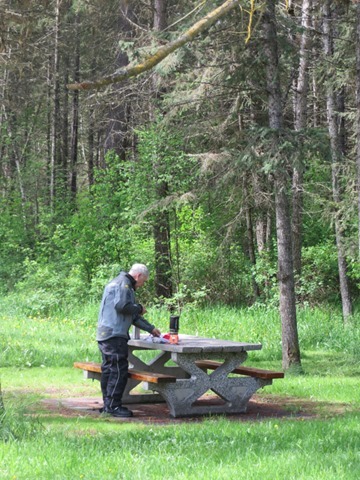 In fact, here is a picture from the campground. 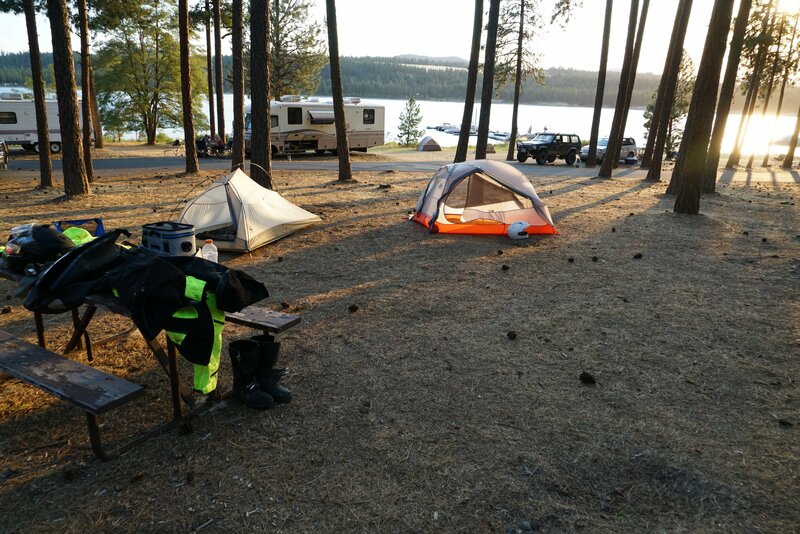 The campground we are at is mostly full… We only had a couple of spots to choose from. The sites are pretty open, without much privacy. We can hear the ferry go back and forth…. Not sure how late it runs. They do have some nice bathrooms though! 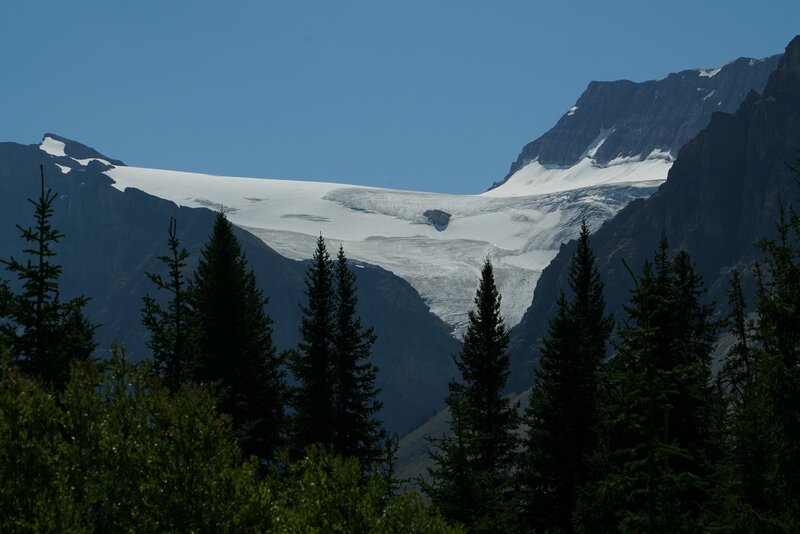 Glacier – Banff – Jasper motorcycle trip. 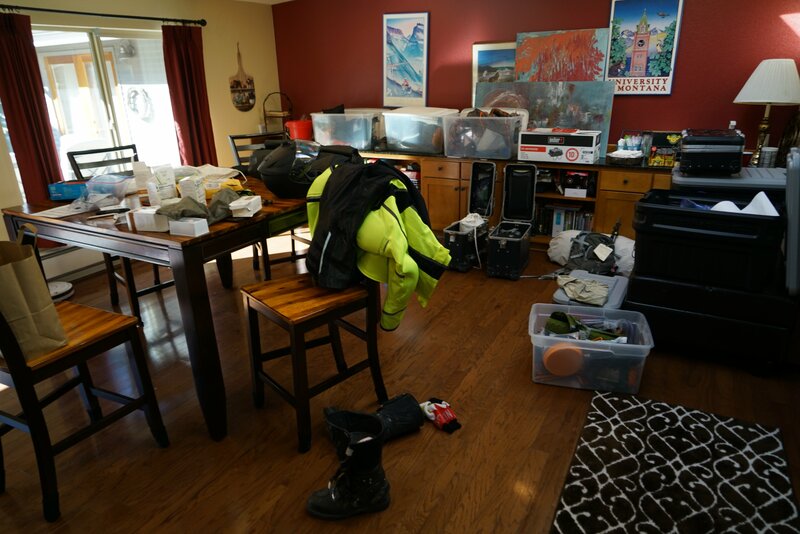 Getting ready to leave on a motorcycle trip too Glacier Park, Banff, and Jasper. We are leaving on Friday (9/18). If you’d like to follow along, you can go to the link at http://tinyurl.com/ybfmqenx. I’ve got our approximate route loaded on the map, with each day as a different color. It was cold last night! I didn’t have my sleeping bag zipped up all the way and I woke up shivering. I put on my “pillow” (also known as my down jacket), to help warm up and then it was back to sleep. Woke up around 5a shivering again! I was out of gear to put on. I suffered for a bit and then got out of bed. The temperature on my bike read 34F when I checked. I gave myself a sponge bath with baby wipes since there were no showers at the campground. (BTW baby wipes are awesome to have along on a trip like this). My plan for clothes was to try to go three days before rotating to the next set…I changed my mind two days is plenty. I’m glad I brought three sets of clothes. We decided to go for a shorter ride today – only 260ish miles. 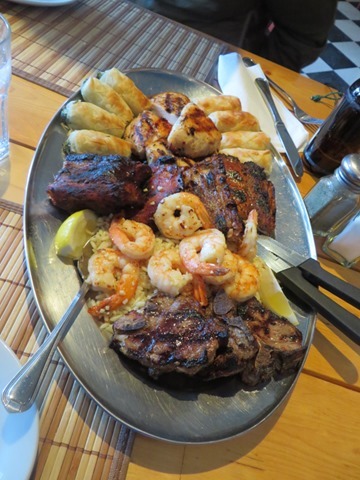 This allowed us to stop more, and get into camp a bit earlier and relax. We had our first official safety break today. Our plan is to take a “safety break” at any point that either of us feels tired. My dad made the first call today so we pulled over at a rest area so he could relax and make some coffee. Didn’t actually take a nap, but did hang out for about an hour. 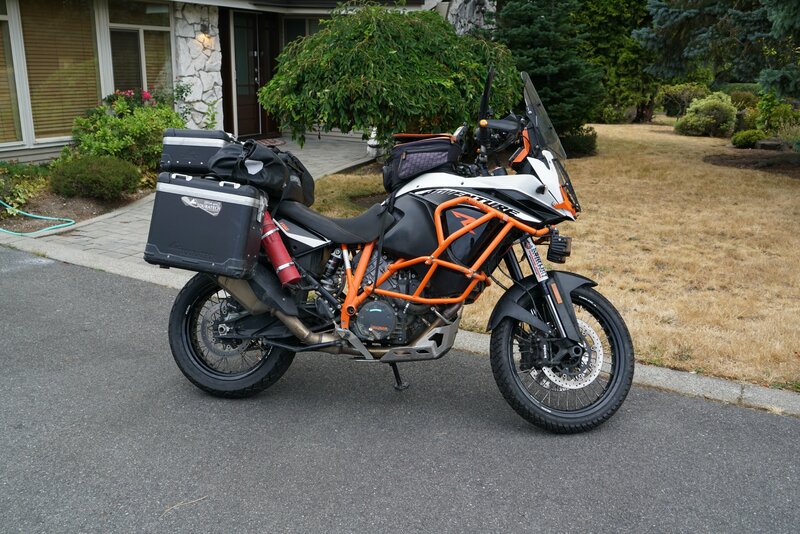 The KTM attracts attention whenever we stop. Last night, the campground host lady thought the orange crash bars were the coolest thing ever! Today we stopped to look at the GPS for distance to fuel, and a random guy came up to me and started chatting about it – apparently his buddy has one on order. Everyone thinks the Husky is a Honda since my dad has all the logos covered up. The ride today was pretty ho-hum. The weather was mostly nice, with a couple of short showers. The scenery was trees and the roads were pretty straight. 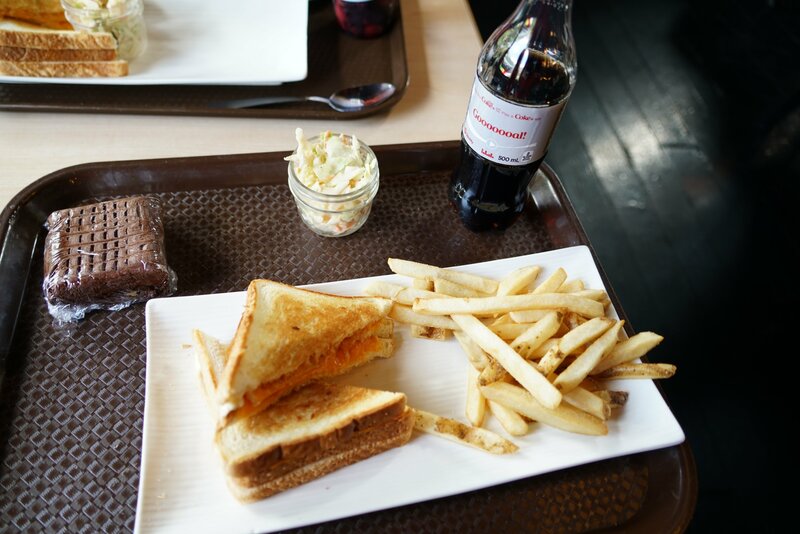 We stopped in Prince George for lunch (and WiFi to upload yesterday’s post). There is a Walmart in town…went in to grab some hats to help keep warm while sleeping. In fact, here is my dad modeling our awesome purchase. 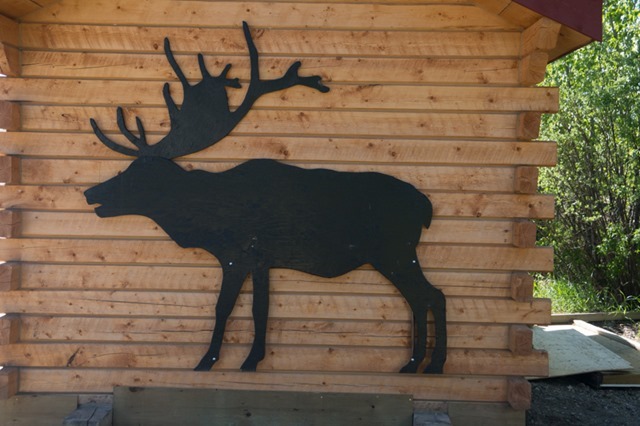 We are staying at Beaumont Provincial park tonight. As we pulled in, there was thunder in the distance. We rushed to get our tarps set up so we would have someplace to hang out while the shower passed. But, the rain never came. 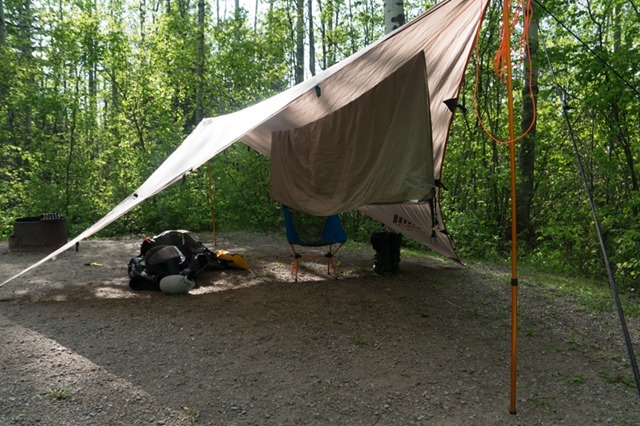 The ground cloth for my tent was pretty wet and dirty from last night, so I rigged up a clothesline underneath the tarp. Once it dried, I used my tent broom to sweep off the dirt. Worked out pretty well! There are a few mosquitoes here. Nothing like we expect to see when we get further north. I’m wearing a ExOfficio BugsAway pants, shirt, and jacket. I treated my socks with Permethrin myself. I’m writing this right before I go to bed, and I haven’t had any bug bites at all! We are on the road! 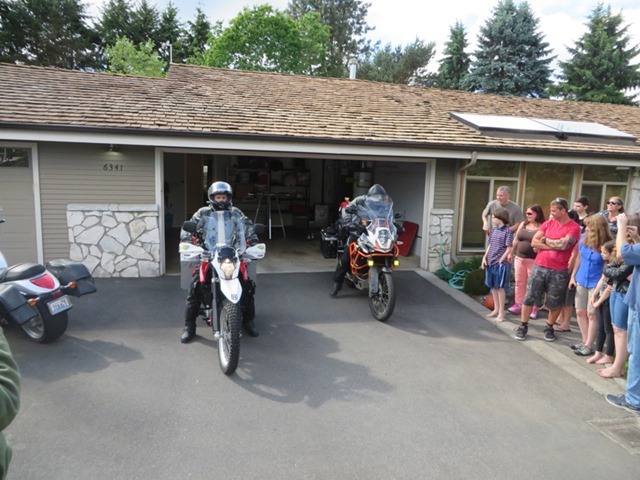 We started the day out with a barbeque at my house so some of our friends and family could check out the bikes and the route we plan on taking. It was lots of fun talking about the bikes and equipment we are bringing. We had a big map printed from Garmin Basecamp up on a wall, so people could see our route. Of course leaving was far from uneventful. First off, our headsets were not connecting. With the pressure of everyone waiting for us to leave, we gave up and used a cell phone connection to talk. I also tried riding off without one of my cameras (one of the guests was taking pictures as I was getting on the bike). My Dad forgot to turn on his InReach, so we pulled over about 5 miles after leaving so he could get it set up. The ride was short (about 85 miles) and uneventful. We cruised up Highway 9 to miss the holiday traffic. Once we were north of Everett, we cut over to I5 and then Chuckanut drive. We are staying at Larrabee State Park tonight. There are showers in the forecast tonight, so we set up our tarps (ok, we are just geeks and wanted to play with our tarps). Tomorrow we are up early and heading into Canada. 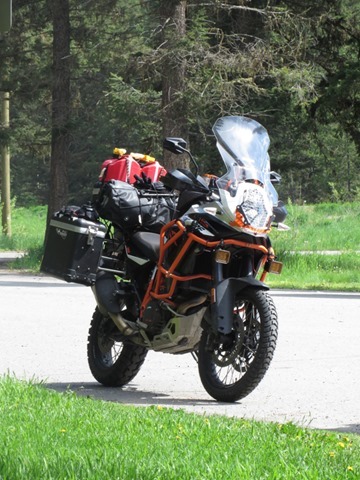 The bikes are pretty heavy when trying to muscle them around parking, but once you are moving on the road, the go without any problems. 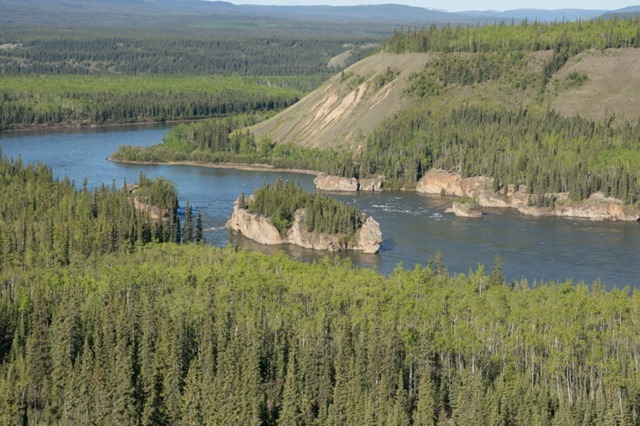 I verified that the Spotwalla and Delorme tracking sites are working, so follow along!